DentaSure® by Natural Wonder Pets removes harmful layers of plaque and tartar, strengthens gums and teeth, freshens breath and can help to reverser gingivitis.... and NO Alcohol! How Did Dogs Develop Such Potential For Dental Problems? DentaSure® solves the problem! Thousands of years ago, before dogs and cats decided to befriend us humans, a typical diet consisted of about 65% protein, 30% fat, and 5% teeth-cleaning byproducts such as bone and cartilage. Back then, eating was a vigorous activity that included thorough, automatic teeth cleaning as part of the process. Wolves for example, from which today’s dogs evolved, posses a bone-crushing bite force of up to 1500 pounds per square inch. So eating and brushing went hand in hand. Nature's own dog dental program. But today’s commercial dog and cat food industry serves up the exact opposite menu, leaving the natural process of teeth cleaning back in the evolutionary past. Go ahead, look at your dog or cat’s teeth. Do you see the warning signs of gum disease – bad breath, red and swollen gums, a coating of yellow-brown tartar around the gum line? You’re looking at periodontal (gum) disease, the number one diagnosed dog dental and/or cat dental problem in America! The Solution is Called DentaSure ® All-Natural Oral Care Spray! ... and it is truly an affordable, one-of-a-kind, revolutionary breakthrough in “brushless” dog or cats dental health care. NO ALCOHOL! Simply spray DentaSure ® on your dog or cat’s teeth twice each day for 2 to 4 weeks, then once a day for ongoing maintenance. It's best to apply at least 30 minutes before or after feeding. (Instructions for cats and dogs of different sizes are on the label.) Watch years of ugly plaque and tartar vanish before your very eyes. Now you can feel better about your furry friend's good health and positive future. You can even amaze your friends with how gleaming white your dog's or cat's teeth have become. What Do Dog Owners Say About DentaSure®? "I just want you to know my vet was more skeptical than I was at first. One month later I took Fritzy back in... not for teeth cleaning, but to show her off! Thanks for saving me hundreds or maybe even thousands of dollars." P.S. I use your DentaSure®, too! Charlie had gingivitis- not anymore! I am truly grateful to you for your DentaSure spray. Charlie's teeth and gums are strong and healthy now. He has more energy than I've seen in years! Thanks for everything. I'm telling all my friends. I love your natural products. I use DentaSure too and can't remember the last time I had a cold, sore throat or flu. I had a toothache with an incoming wolf tooth. I put DentaSure on the incoming tooth that had been hurting me all day, the pain was gone in minutes and has lasted for weeks. I am excited to use this wonderful product on my own dogs and highly recommend it to everyone. Order DentaSure® Today and Enjoy The Benefits For Your Dog! Dental Health is something that is achieved through products that promote dental health! 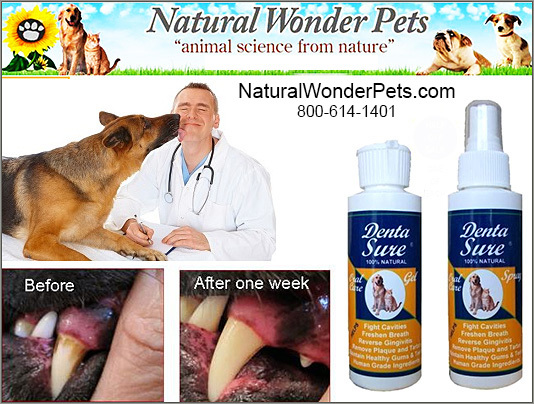 DentaSure® is at the forefront of the best in Dental care for your dog or cat. Don’t let your pet suffer or go through the experience of ordering inferior products- or ones with harmful ingredients (like alcohol). We are excited to take your order and look forward to hearing from you -- Call today!